Randy Scheunemann, founder and president of the public relations firm Orion Strategies, is a well-connected lobbyist and political insider who has advised a number of conservative political figures, supported the work of various neoconservative-led advocacy groups, and lobbied on behalf of defense industry clients and foreign governments. Along with neoconservative figures like Robert Kagan and William Kristol, Scheunemann served as a director of the now-defunct Project for the New American Century (PNAC), a letterhead group that played an important role in building support for the Iraq War and an expansive “war on terror.” He also headed the Committee for the Liberation of Iraq (CLI), a post-9/11 advocacy outfit that pushed for war in Iraq. Like PNAC, CLI played a key role forging a coalition of Beltway figures who supported a Middle East agenda that had at its core toppling Saddam Hussein. Other CLI members included Sens. John McCain (R-AZ) and Joe Lieberman (I-CT). Scheunemann has long been closely associated with Senator McCain, having worked on his various presidential bids, including in 2000 and 2008. Scheunemann was sharply critical of other presidential contenders during the 2008 campaign, sometimes charging them with having a “September 10 mindset” that was not suited to fighting terrorism. While commenting on Mitt Romney's support for "timetables and milestones" for the Iraqi government, Scheunemann asserted that McCain "does not believe in timetables or deadlines, secret or otherwise. He has made it clear that setting a timetable or deadline is nothing more than setting a date certain for surrender." In mid-2007, Scheunemann called the idea of withdrawing troops from Iraq “ludicrous. Because the idea that we will be able to better prevent sectarian violence and fight al-Qaida better from Kuwait than how we are doing it now is laughable." Scheunemann worked previously for McCain as an adviser for the senator’s failed 2000 presidential bid during a period when the candidate’s views on foreign affairs evolved dramatically. John Judis writes that the candidate began "seeking to differentiate his views from those of other Republican presidential aspirants and from the growing isolationism of House Republicans … [placing] his new interventionist instincts within a larger ideological framework. That ideological framework was neoconservatism. McCain began reading the Weekly Standard and conferring with its editors, particularly Bill Kristol." Shortly after his staff consulted with Kristol, McCain hired a bevy of neoconservative-aligned operatives, including Scheunemann, Marshall Wittmann, and Daniel McKivergan. The impact of this group of advisors on the senator's thinking was revealed in early 1999, Judis reported, when McCain spoke at Kansas State University using a speech Scheunemann helped draft. In it, McCain echoed the neoconservative idea of "national greatness conservatism," arguing: "The United States is the indispensable nation because we have proven to be the greatest force for good in human history…. [W]e have every intention of continuing to use our primacy in world affairs for humanity's benefit." Judis reported about the stumping, "The centerpiece of the speech was a strategy that McCain called 'rogue-state rollback,'" a term Scheunemann claimed to have created based on rhetoric used by critics of 1950s Cold War containment strategy. Scheunemann’s Capitol Hill experience dates back to the mid-1980s, when he began working for a number of congressional committees. According to his biography on the PNAC website, between 1986 and 1993 Scheunemann "served on the staffs of the Senate Foreign Relations Committee, the House Foreign Affairs Committee, and the House Republican Policy Committee." He then became a senior advisor to Republican presidential candidate Sen. Bob Dole (R-KS) in 1996, served on the 1996 Republican Platform Committee, and between 1993 and 1999 was national security advisor for Dole and Sen. Trent Lott (R-MS). In 1997, during the time he worked as a congressional aide for Lott, Scheunemann reportedly forgot to remove a shotgun from his car after a duck-hunting trip; when he drove up to the U.S. Capitol to report for work, he was arrested for possession of an unregistered firearm. Scheunemann's PNAC bio states that during his time working on the Hill, he "was involved in Senate deliberations concerning the use of American military power in Somalia, the Korean Peninsula, Iraq, Haiti, and Bosnia. He also served as coordinator for Senate Republican policy on UN reform, congressional-executive war powers, NATO enlargement, global climate change, economic sanctions, ballistic missile defense, and technology transfers to China." Scheunemann helped draft the 1998 Iraq Liberation Act, which made the toppling of Saddam Hussein an official U.S. policy goal and authorized $98 million for the Iraqi National Congress, a loose grouping of Iraqi dissidents led by Ahmad Chalabi that has been widely blamed for channeling false intelligence about Iraq. Scheunemann also served briefly as an advisor to Defense Secretary Donald Rumsfeld early in the George W. Bush administration as a consultant on Iraq policy. According to the Lobbying Registration office of the U.S. House of Representatives and the watchdog group OpenSecrets.org, Scheunemann's former lobbying firm, Scheunemann & Associates, represented the National Rifle Association for several years. In 2005, the firm also represented the Caspian Alliance, a consortium of oil- and gas-producing nations from the Caspian region. Scheunemann has also led the lobbying firms Orion Strategies (which he owns) and the Mercury Group. Clients of the Mercury Group have included Swiftships Shipbuilders, Barrett Firearms Manufacturing, BP America, Air Force Memorial Foundation, Lockheed Martin, National Shooting Sports Foundation, and Sporting Arms and Ammunitions Manufacturers. Much of Scheunemann’s work, in both the public and private spheres, has been oriented toward Europe, promoting democratic programs and expanding NATO to former Soviet-bloc countries. 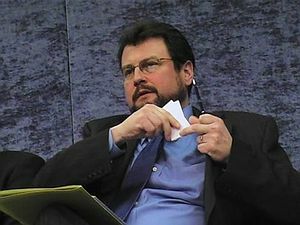 A board member (along with McCain) of the International Republican Institute (IRI)—a key institutional vehicle through which the National Endowment for Democracy carries out its work—Scheunemann has worked closely with Bruce Jackson, a fellow former PNAC director, on NATO expansion issues, serving as a board member of Jackson's U.S. Committee on NATO and as a registered lobbyist and/or consultant for Georgia, Latvia, Macedonia, and Romania. According to the Financial Times, while serving as "an American adviser to the Georgian government" in late 2006, Scheunemann criticize the Bush administration’s consultations with Russia in the U.N. Security Council regarding security issues in Georgia. He accused Secretary of State Condoleezza Rice of "appeasement" for acquiescing to Russia’s demand for a U.N. resolution regarding the Russia-supported republic of Abkhazia, which broke away from Georgia, in exchange for Russia's support of sanctions on North Korea in the wake of that country's nuclear test. Said Scheunemann: "What Rice approved was a weak, ambiguous resolution on North Korea. They sold out the Georgians. That was the trade." Jim Lobe and Michael Flynn, “The Rise and Decline of the Neoconservatives,” Right Web, November 17, 2006, https://rightweb.irc-online.org/rw/3713.html. 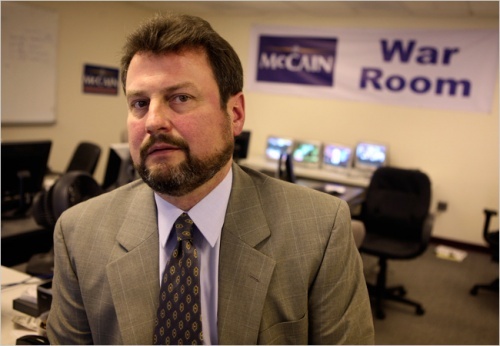 Peter Slevin, “Randy Scheunemann: McCain Adviser Campaigned for War,” Washington Post, The Trail Blog, June 17, 2008, http://voices.washingtonpost.com/44/2008/06/randy-scheunemann-mccain-advis.html. Jim Lobe, "Committee for the Liberation of Iraq Sets Up Shop," FPIF Policy Report, November 2002. Justin Elliot, “Top Palin Aide is on Soros' Payroll,” Salon.com, November 12, 2010, http://www.salon.com/news/politics/war_room/2010/11/12/orion_soros_palin. Scott McConnell, “Standard Operating Procedures: How the Neocons Are Co-opting the Tea Party,” Right Web, November 9, 2010, https://rightweb.irc-online.org/articles/display/standard_operating_procedures_how_the_neocons_are_co_opting_the_tea_party. Elias Groll, “Who Was Right on Ukraine: Sarah Palin or FP?” Foreign Policy “Passport” blog, March 3, 2014, http://blog.foreignpolicy.com/posts/2014/03/03/who_was_right_on_ukraine_sarah_palin_or_fp. Robin Abcarian, “Sarah Palin connects Putin and Ukraine aggression to Obama's jeans,” Los Angeles Times, March 4, 2013, http://www.latimes.com/local/abcarian/la-me-ra-sarah-palin-on-ukraine-putin-and-obamas-pants-20140304,0,5665367.story#ixzz2vDpgVyPA. David Kurtz, “Giving Them Fits,” Talking Points Memo, http://talkingpointsmemo.com/archives/2013/01/giving_them_fits.php?ref=fpblg. Eli Lake, “Chuck Hagel’s Career Shows He’s Not Afraid to Change His Mind,” January 10, 2013, Daily Beast, January 10, 2013, http://www.thedailybeast.com/articles/2013/01/10/chuck-hagel-s-career-shows-he-s-not-afraid-to-change-his-mind.html. Barry Meier and Kate Zernike, “McCain Finds a Thorny Path in Ethics Effort,” New York Times, May 20, 2008, http://www.nytimes.com/2008/05/20/us/politics/20mccain.html. Michael Cooper, “Campaigns in a Skirmish over Law and Terrorism,” New York Times, June 18, 2008, http://www.nytimes.com/2008/06/18/us/politics/18mccain.html. Jason Horowitz, "The Iraq-eteers," New York Observer, April 15, 2007, http://www.observer.com/node/31994. Quoted in Jason Horowitz, "McCain's Bulldog," New York Observer blog, April 11, 2007, http://www.observer.com/node/32000. John Judis, "Neo-McCain," New Republic, October 16, 2006, http://www.tnr.com/article/politics/neo-mccain. John Judis, "Neo-McCain," New Republic, October 16, 2006. http://www.tnr.com/article/politics/neo-mccain. Project for the New American Century, “Biography of Randy Scheunemann,” http://web.archive.org/web/20070810114215/http://www.newamericancentury.org/randyscheunemannbio.htm. John McCaslin, “Sitting Duck,” Washington Times, February 5, 1997. Jim Lobe, "New Champions of the War Cause," Asia Times, November 6, 2002, http://www.atimes.com/atimes/Middle_East/DK06Ak02.html. “McCain Foreign Policy Aide Outlines Iraq Position,” All Things Considered, National Public Radio, June 26, 2008, http://www.npr.org/templates/story/story.php?storyId=91940482; Kurt Nimmo, “Committee for the Liberation of Iraq: PR Spinning the Bush Doctrine,” CounterPunch, November 19, 2002, http://home.comcast.net/~bushblog/Imported_documents/McCaffrey1.htm. OpenSecrets.org, Center for Responsive Politics, “Lobbying: Scheuemann & Assoc,” http://www.opensecrets.org/lobby/firmsum.php?lname=Scheunemann+%26+Assoc&year=2002. rcury Group,” http://www.opensecrets.org/lobby/firmsum.php?year=1999&lname=Mercury+Group; Lobbying Disclosure Office of the U.S. House of Representatives, http://lobbyingdisclosure.house.gov/. John Judis, "Minister Without Portfolio," American Prospect, May 1, 2003, http://www.prospect.org/cs/articles?article=minister_without_portfolio; Mark Benjamin, “John McCain’s Tough Stance Towards Russia,” Salon.com, June 9, 2008, http://www.salon.com/news/feature/2008/06/09/mccain. Guy Dinmore, "Georgia Feels at the Mercy of Big Powers' Maneuvers," Financial Times, October 21, 2006.